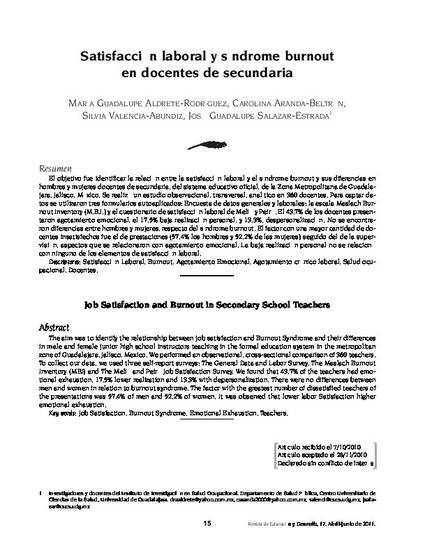 The aim was to identify the relationship between job satisfaction and Burnout Syndrome and their differences in male and female junior high school instructors teaching in the formal education system in the metropolitan zone of Guadalajara, Jalisco, Mexico. We performed an observational, cross-sectional comparison of 360 teachers. To collect our data, we used three self-report surveys: The General Data and Labor Survey, The Maslach Burnout Inventory (MBI) and The Meliá and Peiró Job Satisfaction Survey. We found that 43.7% of the teachers had emotional exhaustion, 17.5% lower realization and 13.3% with depersonalization. There were no differences between men and women in relation to burnout syndrome. The factor with the greatest number of dissatisfied teachers of the presentations was 57.4% of men and 52.2% of women. It was observed that lower labor Satisfaction higher emotional exhaustion.